Wondering what is on the menu for Mother's Day Brunch? 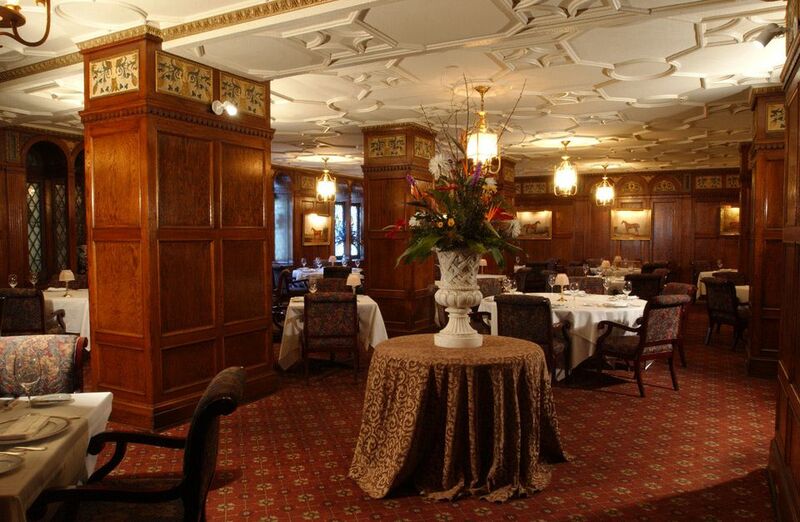 Well, if you are headed to the English Grill at the Brown Hotel, below is an idea of what you can expect at this famous spot on Mother's Day. Call ahead to confirm, but there usually is soup, four or five salads to choose from, a seafood table—think classic shrimp cocktail, oysters on the half shell and salmon—an assortment of cured meats and local cheeses, a couple of quiche options, a meat or fish option, and, of course, desserts. Not only is it a delicious meal, but you can treat your mother a Mother's Day meal and enjoy some time in downtown Louisville. Stroll Main Street's historic buildings, or, if you are feeling up for entertainment, tour Evan William's Bourbon Experience and/or see if there is a play at Actors Theatre of Louisville. The signature dining room of the Brown Hotel, the English Grill serves contemporary American cuisine with a Kentucky twist. It's a classy atmosphere, reminiscent of a private club, with dark oak paneling, lead glass windows and equestrian paintings. Contemporary food aficionados enjoy The English Grill’s two unique chef’s tables. Named a Top 10 Chef’s Table experience by Forbes Traveler magazine, the chef’s tables are once-in-a-lifetime experiences that connect guests with the Brown’s stellar culinary team. Others want something more casual, like popping into the Brown Hotel for the celebrated sandwich that holds the hotel's name. Yes, we are talking about the Hot Brown Sandwich. Here's a link to a recipe for the famous Hot Brown Sandwich, courtesy of the culinary experts at the Brown Hotel. The English Grill is open Monday through Thursday, 6-9 p.m. and Friday and Saturday, 5-10 p.m. The English Grill is closed on Sunday. The Grill hosts special events featuring winemakers and visiting chefs throughout the year. If you are visiting, take note: Reservations are recommended. The restaurant is nonsmoking. Business Casual attire is highly encouraged. Here is a guide on what to wear - Men: Slacks or dress jeans paired with dress shirt or knit shirt with collar is required (jackets optional.) Women: Dresses, slacks, dress jeans or skirts paired with blouse or finer knit shirt required (jackets optional). Cell phone use is not permitted. Valet parking is complimentary when dining in The English Grill.